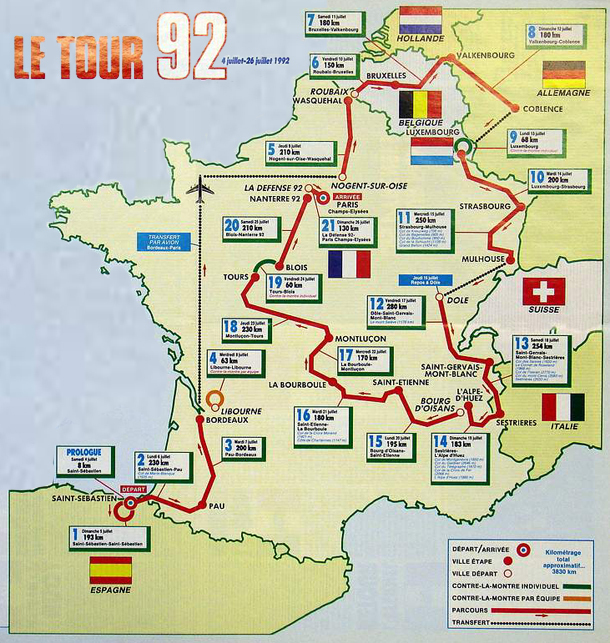 The 1992 Tour had 21 stages plus a prologue that totaled 3983 kilometers. It was ridden at an average speed of 39.504 km/hr. 198 riders started and there were 130 classified finishers. This was Miguel Indurain's second of five consecutive Tour victories. In May he had won the Giro d'Italia in his normal race winning style. He contained his rivals in the mountains and hammered them in the time trials. To celebrate the signing of the Maastricht treaty that signalled the coming integration of Europe, the 1992 Tour visited 7 countries: Spain, France, Belgium, Netherlands, Germany, Luxemboug and Italy. Prologue: Saturday, July 4, San Sebastian 8 km Individual Time Trial. Stage and GC places and times are the same. 9. Edwig Van Hooydonck s.t. 6. Jim Van De Laer s.t. 7. Adri Van Der Poel s.t. 8. Jean-Paul Van Poppel s.t. 9. Peter Le Clercq s.t. 6. Acacio da Silva s.t. 8. Maarten Den Bakker s.t. 9. Etienne De Wilde s.t. It was clear from Indurain's spring racing results that he had maintained his masterful 1991 form. He won the 1992 Giro d'Italia the same way he won the 1991 Tour de Francea la Anquetil. He contained his rivals in the mountains and won both time trials. He also won the Spanish Road Championships and the Tour of Catalonia. He was ready to join Coppi, Anquetil, Merckx and Hinault by going for the Giro-Tour double. Gianni Bugno, who was second to Indurain in the previous year's Tour, was gunning for a Tour victory. Looking back, we can see that 1990 and 1991 were really Bugno's best years. He came to the Tour as the reigning World Champion. His spring was quiet but a third in the Dauphiné Libéré and a second in the Tour of Switzerland showed that his condition was coming on at just the right time. Chiappucci's second in the Giro (to Indurain) signaled that he too was ready to race. The 1992 edition flitted all around western Europe. To commemorate the signing of the Maastricht treaty and its promise of an integrated European Union with a single market, the Tour schedule called for visits to Spain, France, Germany, Holland, Belgium, Italy and Luxembourg. The action started with a prologue in San Sebastian, Spain. Indurain nailed it and set the tone of the race. In second place was a new revelation, Swiss rider Alex Zülle. Riding for the Spanish ONCE team, he was only 2 seconds slower than Indurain. The next day, by getting his hands on an intermediate time bonus, Zülle was able to land the Yellow Jersey. Indurain beating them all in the Prologue. Miguel Indurain, in an interview in Cycle Sport Magazine, said: "If by magic I were going to ride the Tour in 2003, what would interest me most would be the prologue. It's the most emotive moment, where the tension accumulated during a year of work is released like a gunshot." Zülle's ownership of the precious garment was short-lived. While the 1992 Tour mostly avoided the Pyrenees, it did make sure that the riders got a taste of the lash with a trip up the Marie-Blanque. That brought out another new face, Richard Virenque. Virenque was not originally included in his team's lineup for the Tour and was a last-minute addition. He won the stage and took the lead from Zülle, who finished 12½ minutes behind the flying Frenchman. Virenque's possession of the lead would be just as short as Zülle's. Stage 3 saw a break get a big 7-minute lead. Pascal Lino, a teammate of Virenque's on the RMO squad, was in the group of escapees and took over the lead with 2 minutes over Virenque and 6½ minutes on third-place Indurain. Virenque and Lino's RMO squad faced the stage 4 63.5-kilometer team time trial knowing that they would lose time. Some teams practice and become very skilled at team time trials. They ride with ability, close together, driving each other just hard enough so as not to tear the team apart. They usually have riders who can put out the brute horsepower needed to propel the team at high speed on the flats. Others teams are terrible and can lose tremendous amounts of time. For a team with General Classification ambitions, Indurain's 1992 Banesto squad was slightly weak in this discipline. The Panasonic team won. Chiappucci's Carreras were only 7 seconds behind and Bugno's Gatorade team was third at 21 seconds. The Motorola team, riding for Andy Hampsten came in sixth, losing 48 seconds to Panasonic but coming in 2 seconds faster than Banesto. 1992 was the first Tour appearance of one of the iron men of American cycling, Frankie Andreu. This was the first of the 9 consecutive Tours Andreu completed, a superb record. For a race that was supposed to be dominated by the cool, unflappable, dare I say it, dull Miguel Indurain, the surprises kept coming. Stage 6 was a rough, hard northern European classic-type stage with tough, short hills, bad weather and cobbles. The race broke up into small pieces under the stress of a powerful breakaway that included some of the finest racers alive. Laurent Jalabert, Greg LeMond, Claudio Chiappucci and Brian Holm pounded away from the field with Jalabert getting his first Tour stage win. Indurain was in the first chase group, 1 minute, 22 seconds back. Lino, with a healthy time cushion, kept the lead. This put Chiappucci in third (at 3 minutes, 34 seconds) and LeMond in fifth (at 4 minutes, 29 seconds). This was good, aggressive tactical riding, not letting Indurain set all the terms of when and how the Tour would be contested. Through the French Jura, even though there were rated climbs with attacking by riders who were not in contention for the Yellow Jersey, the real Tour men held their fire, keeping their powder dry for the first big Alpine day. Stage 10 in Strasbourg: Jean-Paul Van Poppel (right, in PDM jersey) wins the sprint from Jalabert (in green), Abdoujaparov (blue shorts) and Johan Museeuw (Belgian Champion's jersey). That day came on the thirteenth stage, 254.5 kilometers from St. Gervais to Sestriere in Italy. The climbing was substantial. The riders faced the Saisies (category 2), the Cormet de Roseland (category 1), the Iseran (hors category), Mont-Cenis (category 1) and the first category climb to the finish at Sestriere. Claudio Chiappucci was what Miguel Indurain wasn't. Where Indurain was cold, calculating, riding only to win and no more, knowing that whatever gaps he had allowed could be closed with a display of brute horsepower in the time trials, Chiappucci was the opposite. The Italian was willing to gamble, to take magnificent chances to gain time. He had to run these big risks knowing how vulnerable he was in the time trials. Indurain said that he had to have eyes on the back of his head when he raced Chiappucci. Americans often express contempt for Chiappucci and his wild excursions and attempts to break away, failing to understand that his flamboyant style served him very well. His Grand Tour accomplishments are notable. Tour de France: twice second, a third and King of the Mountains. For the Giro: twice second plus a third, a fourth, a fifth along with 2 King of the Mountains and 1 Points jersey. This is consistent riding at the very highest level. As he had done in the 1990 stage to Luz Ardiden, Chiappucci gambled and gambled big. The first major climb of the day was the Saisies. 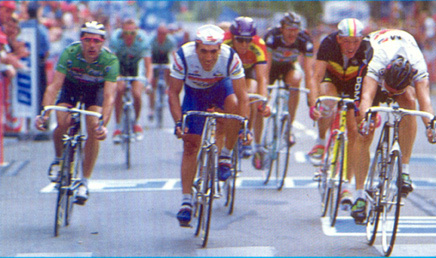 Chiappucci escaped with some other riders, but not with his main challengers, Bugno and Indurain. As far as they were concerned, this was far too early in such a monstrous stage to be taking off. By the time Chiappucci reached the top of the Iseran he was alone. Back in the leading group, the Banesto squad had at last recognized the threat. They assembled at the front and started working to bring the fleeing Italian back. Bugno was riding the Tour to win. He knew that this was the Tour's moment, yet he was trapped with Indurain. He was stifled. Chiappucci was riding away with the race. He didn't want to escape and chase Chiappucci knowing he would be taking Indurain along. He finally decided that it was better to take his chances with Indurain rather than accept the sure loss of Chiappucci's riding to a mountain top win. Bugno knew that the solo Chiappucci would be finishing in Italy where the fanatical tifosi would lift him up the mountain with their thrilled and thrilling cheers. When Bugno attacked, as expected, he took along Indurain as well as Andy Hampsten and Franco Vona. The great chase was on. I still remember how exciting it was on TV. I think nearly everyone watching was wishing the lone, brave Chiappucci up the mountains while surely, the inexorable, machine-like Indurain would run him down before the end of the stage. Indurain couldn't catch his man. Chiappucci, after riding alone for 125 kilometers, celebrated a brilliant victory. Vona was only 1 minute, 34 seconds behind. Indurain, who ran out of gas on the final kilometers of the final climb, was third, 11 seconds behind Vona. Bugno and Hampsten were next behind him, another minute and a half down. The next stage was another Alpine stage with the Galibier, the Croix de Fer and a finish on L'Alpe d'Huez. All 3 were hors category climbs. Andy Hampsten was riding beautifully this year and this stage was the perfect showcase for his wonderful climbing abilities. He had been in the big break with Indurain on the big stage the day before and acquitted himself magnificently. Could he recover overnight from 5 major climbs and over 250 kilometers of racing and be able to take on the next day's monsters? Stage 14: Hampsten wins big on L'Alpe d'Huez. On the Croix de Fer, the penultimate climb, a couple of riders went clear of the highly reduced, Banesto-led peloton. Hampsten joined them with a couple of others. In the group of 5, importantly, was dangerman Franco Vona, who had come in second the day before. Well clear of the pack, they went over the crest of the Croix de Fer together. In the valley leading to L'Alpe d'Huez the group worked well together and continued to increase their advantage. They started up the Alpe with a lead of nearly 4 minutes. Hampsten started the climb at a good tempo and slowly wound it up, going from his 39-23 to the 21 and finally dropping to the 18! It's hard to explain to someone who has not ridden a climb of this severity (hors category) how completely beyond the normal human experience ascending a mountain this steep this fast after a day's racing really is. Only a few people in the world can do it. 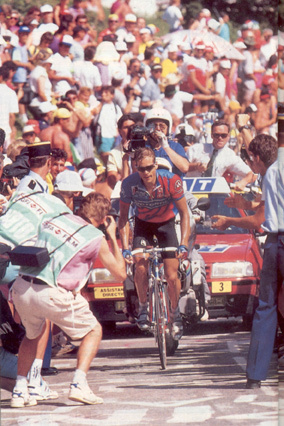 With about 7 kilometers to go Hampsten was alone, riding to victory in the most prestigious of mountain stages. This was his seventh Tour and his first Tour stage victory. If you're going to win, you might as well win big. The Tour then went over the Massif Central, but nothing happened to change the general order of the overall. The only stage left that could affect the General Classification was the nineteenth, a 64-kilometer individual time trial. Again, Indurain put real distance between himself and his competitors. Bugno was only 40 seconds behind on that stage, lifting himself back onto the podium after losing his place with his disastrous L'Alpe d'Huez stage. Chiappucci was about 3 minutes slower. Andy Hampsten was the real loser that day being 5 minutes, 33 seconds behind the mighty Spaniard and being pushed down to fourth place in the General Classification. With only 2 stages left, the competition to win the Tour was over. 6. Pedro Delgado (Banesto) @ 15 minutes 16 seconds. Indurain had his second Tour and his first Giro-Tour double. Chiappucci not only came in second, he was King of the Mountains. It should be noted that Chiappucci had ridden so consistently that he was third in the race for the points leadership. After an exhausting battle with Belgian classics specialists Johan Museeuw, Laurent Jalabert won the Green Points jersey. The 1992 Tour was the fastest to date with an average speed of 39.504 kilometers an hour.